An all-in-one Mac DVD to iPhone ripping software to rip and convert DVD to iPhone, iPad, Apple TV, iTunes, MP4. It's rediculous to purchase movies from iTunes again and again. MacX iPhone DVD Ripper is the way out, which is an innovative program to digitize any DVD to a wide selection of output formats, thus you can play these hollywood DVD movies on portable devices like iPhone (iPhone XS/XS MaX), iPad (iPad Pro/Air/Mini included), Apple TV 4 and iTunes. You will also get the choices to easily and freely rip DVD to MP4, H.264, MOV, M4V or music MP3, AAC, AC3 with up to 8x the real time. It allows you to convert both homemade and copy protected DVD to iPhone without sacrificing any video quality yet at lightning speed. With optimzied preset profiles for iPhone, iPad and Apple TV, the app gives you the choice of making backup of your movies quickly and easily by ripping any DVD to high quality MP4 (H.264 and MPEG-4 format), which is compatible with iPhone (iPhone XS/XS Max/XR/X/8/7), iPad Pro/Air/Mini, Apple TV 4 and iTunes. No need to purchase movies and play Hollywood DVD movies on iPhone iPad anywhere anytime, without taking along with discs. 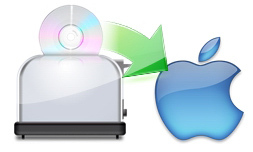 Besides ripping DVD to device specific formats, the DVD ripper for Mac is also capable of converting DVD files to MOV video that can be played by QuickTime Player, ripping DVD movies to MP4 which can be imported to iMovie for editing or uploaded to video sharing sites, like YouTube, Metacafe, Break, etc. It also helps to rip DVD to Mac general format M4V that's readable by iPhone, iPad and extract audio from DVD to be saved in MP3, AAC, AC3 formats as ringtone for iPhone iPad. MacX iPhone DVD Ripper constantly upgrades to extract both homemade and commercial DVDs to hard drive or portable devices, eliminating all the copy protections and region controls put in place by DVD publishers. It is able to remove CSS encryption, Sony ARccOS, region protection, UOPs, as well as Disney new copy protections. Support ripping all the new DVD releases. It offers the abilities to reduce file size by trimming video to get your favorite segment of the movie, crop frame size to get rid of any unwanted black bars, seperate and merge movie titles into a single video file. You can even add external subtitles to movies and plug in your preferred language subtitle to the movie. For most of the output formats you get a lot of options built in where you can change the audio and video settings allowing you to alter quality, sample rates, video resolution, aspect ratio, and more. For beginners, the default setting will be helpful to better suit the device you own. Supporting multi-core CPU and hyper threading, it automatically detects your CPU and offers you the fastest speed to rip DVD movie to iPhone (up to 8x the real time), without consuming too much of your CPU or slowing down your computer performances. With High Quality Engine build in this DVD to iPhone ripper, the video files extracted from DVD will keep the original audio and video quality. The interface is very user friendly and easy to get around in. Its flexibility offers a decent level of control over things like frame rate, bitrates, etc, which allows you to customize personalized videos. No matter you are newbie or experienced user, you can rip DVD to iPhone supported formats in a few clicks. So to speak, it is suitable for users of all levels. MacX iPhone DVD Ripper moves fast and does its job properly. Three steps are all I need to start the conversion process. Everything is automatic and all I have to do is pick the appropriate profile in order to reach the desired result. It converts DVD video for iPhone, iPod with fast speed. And I can choose the titles to convert as well as the subtitle and audio track I prefer. After a trial of the software, I found that it supports loading the DVD movies that can be not recognized by many other similar ripping tools, so I bought its full version with discount. It is works well more than I imagine. All my Disney animation or Paramount movies can be converted to my iPhone without any quality loss. Convert any video to iPhone, iPod, iPad on Mac OS. It accepts both HD and SD video formats as input, such as MKV, M2TS, AVCHD, AVI, MPEG, WMV etc. It can also convert video to MOV, MP4, YouTube FLV. Packed with MacX iPhone Video Converter and MacX iPhone DVD Ripper, it allows you to rip any DVD and convert all popular used videos (including both HD and SD videos) to iPhone, iPod, iPad, MOV, MP4, MP3 etc with fast speed.